Highly nourishing and protective sunscreen with chemical and mineral filters – non-greasy and suitable for all kinds of skin. The biomimetic lipopeptide in the sunscreen has anti-inflammatory, detumescent, anti-bacterial and soothing properties. Application: Apply as required on the face, neck and chest area over a layer of bdr serum or after the final skincare step. KARANJA OIL: Responsible for providing mineral sun protection, natural oil extracted from the seeds of the Karanja tree. It also has anti-bacterial and anti-inflammatory properties. SQUALANE: Unsaturated fatty acid that is extracted from olives. It leaves the skin feeling pleasant and evens out the skin’s hydrolipidic layer. BIOMIMETIC LIPOPEPTIDE: Biomimetic means that it imitates the skin’s natural lipopeptide. The innovative tripeptide soothes irritated skin and has detumescent and anti-inflammatory properties. 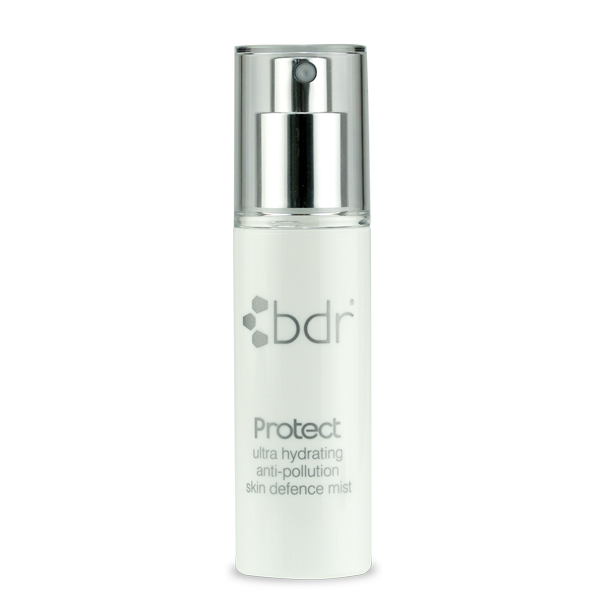 bdr Protect, the innovative spray serum with maximum concentration of hyaluronic acid, is the ultimate protection for your skin anytime, anywhere. ECTOIN: Ectoin is used as an active ingredient in skin care and sun protection. It stabilizes the natural structure of biopolymers and protects the skin from damage caused by stress factors such as UV radiation, drought, heat or cold. In doing so, it ensures a lasting build-up of moisture in the skin. In addition, Ectoin protects the skin’s immune system. MORINGA OLEIFERA SEED EXTRACT: The oil of the Moringa Olifera, also called “miracle tree” or “tree of life”, is the high-quality and above all sustainable alternative to palm oil. The contained essential amino acids together with the high content of antioxidants protect against free radicals and have an anti-aging effect. UREA: Moisture-preserving and healing. The natural moisturizing factor is crucial for the water content of the skin, it is sustainably hydrated. ARGININE: The moisture-retaining agent belongs to the amino acids. It stabilizes the acid mantle of the skin due to the buffer effect and also has a moisturizing effect on the skin.